The Pacific War Online Encyclopedia: Murray, George D.
Murray was an early pioneer of naval aviation, being the 22nd Navy officer to certify as an aviator. He commanded Enterprise at Midway and Task Force 17 (Hornet) at the Battle of the Santa Cruz Islands, and was remembered by members of the crew of Enterprise as "approachable and pleasant" (Tillman 2012). He also served on the Board of Inquiry after Halsey sailed 3 Fleet into a typhoon in late 1944. Murray very nearly lost Hornet off Guadalcanal on 7 September 1942, when it was spared two torpedo hits only because a patrolling aircraft dropped a depth charge in the paths of the torpedoes. When he reported the incident to Ghormley, Ghormley was astounded to discover that Murray had violated a direct order to remain east of longitude 166 East. 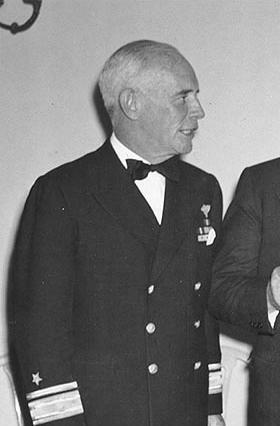 Murray continued to risk his force in submarine-infested waters, for which he drew criticism during the investigation of the torpedoing of Wasp. This likely contributed to the decision to send him to a training command in 1943. He never again held a combat command.